The world is in pieces. No longer the preserve of two competing global powers – or even a single triumphant one – today’s world is nobody’s backyard. Multiple powers have emerged that no longer expect, or strive for, hegemony far outside their own regions. The multipolar world order, still a novelty that requires some getting used to, is inherently unstable in the absence of multilateral ties that bind and channel the interaction of states of blocs. Guterres refuses to criticise the foreign policy initiatives of the current US administration, deemed disruptive by some. In fact, he has managed to build, and maintain, a close working relationship with the US government, an effort that has not gone unnoticed in Washington. US criticism of the United Nations and its many agencies has become more muted of late. By not engaging openly with critics of the world body, Guterres has also managed to keep the UN above the fray of international politics while others, such as the High Commissioner for Human Rights, Zeid Ra’ad al-Hussein, whose term expired in August, have no such qualms. It is not Guterres’ style to seek confrontation. Nor can he afford to chastise those inimical to his organisation. By placing emphasis on the themes and topics that Washington considers of vital importance, and mostly ignoring those the US administration deems detrimental to its interests, Guterres tries to keep the Americans on board. So far, the former Portuguese Prime Minister has been remarkable successful in his pursuit. He is reportedly a favourite of Ivanka Trump – daughter of, and senior adviser to, the US president – whose initiative to help women entrepreneurs source funding for their businesses Guterres has quietly helped shape, in tandem with World Bank president Jim Yong Kim. Both men are now welcome guests at the White House. In his opening speech at the UN General Assembly, late September, Guterres warned that the rules-based global order is nearing breaking point as international co-operation becomes more difficult and the balance between regional powers shifts – sometimes abruptly. The UN secretary-general fears a gradual return to a global order dominated by a few large players who jockey with each other for regional mastery while shunning multilateral co-operative efforts. To function properly and equitably, a multipolar world needs co-operation more than rivalry. 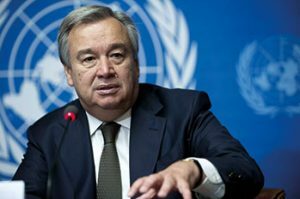 Guterres fears the erosion of universal values and the compromising of democratic principles, including human rights, which already now often take a backseat to sovereignty. “Today, with shifts in the balance of power, the risk of confrontation may increase,” noted Guterres, warning that the worrying trend coincides with the existential threat of climate change. Unusually for a UN secretary-general, Guterres offered a mea culpa for his organisation’s inability to end the wars in Syria and Yemen, or provide the exiled Rohingya people with the protection they needed. He also lamented the UN’s unsuccessful attempts at promoting a two-state solution for the enduring Israeli-Palestinian conflict. However, the UN secretary-general prefers to focus his attention on the many topics the UN can successfully influence and address – such as climate change. He reminded the 130 world leaders present during the opening ceremony in New York that time is running out, and people are clamouring for action. He disagrees with Francis Fukuyama’s premise that history has ended; it was frozen by the Cold War and has resumed its unstoppable march. Nationalism resurfaced while globalisation had to beat a hasty retreat. These are matters of grave concern to António Guterres, who is a committed multilateralist and internationalist.